Premier Dalton McGuinty has wasted no time showing Ontarians who handed him his "major minority" on Oct. 6 and that he won't be pushed around by the Harper government in Ottawa. In a continuing political sparring match, McGuinty let Stephen Harper know not once but twice this week that if there are provincial costs attached to the federal anti-crime legislation, he expects Ottawa to "pick up the tab." McGuinty delivered the first salvo in Ottawa on Tuesday. But his comments didn't receive much media attention. So back in Toronto the very next day, he turned up the heat a notch or two and went after Harper a second time. 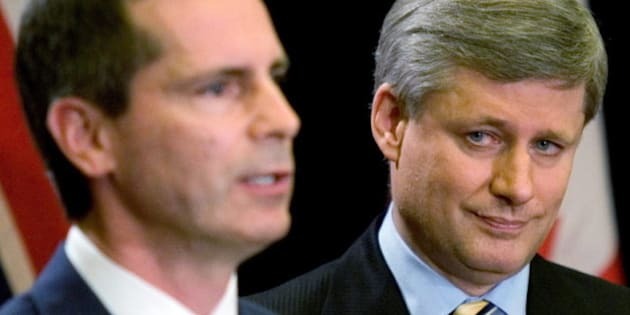 The attack wasn't surprising — McGuinty and Harper have never had a good relationship and when they appear together, the smiles are always through clenched teeth. What was surprising this time was the premier's language and tone. McGuinty can be wishy-washy on issues when he wants to be. But not in this instance, because he believes he's got a case to be made. And after promising voters only he and not Progressive Conservative Leader Tim Hudak could stand up to Ottawa, he wants to prove it. So that's why he complained that the federal government was "foisting" something on Ontario that he says the province does not want. That, as McGuinty sees it, "no premier" would be prepared to pony up the cash to help Ottawa with its anti-crime measures. But when did McGuinty become a spokesman for all the premiers of this country? It may have been, and very well likely was, a "self" appointment. But no matter. It made McGuinty's case seem even stronger as a kind of a street-fighting boast: "You fight me, you fight my gang!" Regardless, McGuinty's comments may just be the beginning. And you can already hear the premier telling Hudak in question period on issue after issue, "Why don't you talk to your federal cousins in Ottawa about that?" Hudak and Harper should begin to worry. If the whispers being heard around the premier's office on the second floor of the legislature are accurate, McGuinty may be prepared to hang around as Liberal leader and make the two H's his favourite target from now to the next Ontario election.